At the behest of a who’s who of Florida politicians, the foyer of Rumberger, Kirk & Caldwell in downtown Orlando was packed with 70 people for an evening fundraiser. Former Gov. Buddy MacKay and his wife Anne mingled in the crowd on Feb. 12. MacKay was just one of several prominent figures lending their names to the goal of raising $300,000 for environmental law scholarships at UF Law. Others included former Gov. Charlie Crist, former Attorney General Bill McCollum, former Comptroller and gubernatorial candidate Alex Sink, and U.S. Sen. Bill Nelson. The law firm and UF Law are spearheading the drive to endow the E. Thom Rumberger Everglades Foundation Fellowship Program. Thom Rumberger, a 1961 graduate of the University of Florida Levin College of Law, died in 2011. Known as the “Defender of the Everglades,” friends and colleagues said Rumberger devoted much of his career fighting on behalf of the Florida environment. “This fellowship celebrates three of Thom’s favorite passions: The Everglades, the University of Florida Law School and the law itself,” Frank Sheppard, managing partner of Rumberger, Kirk & Caldwell, told the crowd. Jon Mills, a UF Law professor and director of the Center for Governmental Responsibility, worked with Rumberger on numerous political projects, environmental and otherwise. “We’re going to have a permanent legacy of students who represent the kind of principled commitment and integrity that Thom Rumberger represented,” Mills said. “So exhibits one, two and three, please step forward.” The three “exhibits” were UF Law students Chelsea Sims, Vivic Babar and Alexis Segal, “These are the type of students who will benefit from the fellowship,” Mills said. Sims is a third-year law student from Bevard County who is working on a Conservation Clinic project securing permits to salvage tires damaging endangered corals off the coast of Fort Lauderdale. Babar is a third-year law student from Lake Mary who works with UF Law Conservation Clinic clients drafting legislation for a noticed general permit for oyster reef restoration and who participated in UF Law’s three-week course on South Florida ecosystems in the Everglades. Segal is seeking an LL.M. 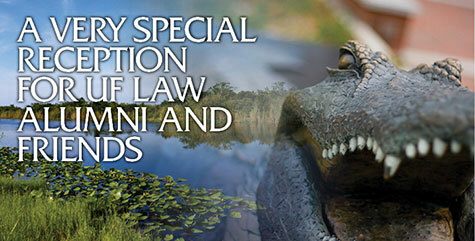 in environmental and land use law who launched the Biscayne Bay Waterkeeper in January 2011. Joining 200 Waterkeepers worldwide, Biscayne Bay Waterkeeper is the first affiliate in South Florida. It’s a nonprofit devoted to protecting, conserving and enhancing the water quality of Biscayne Bay and its surrounding watershed. Segal is a Climate Institute Fellow who works with the UF Law Conservation Clinic to assist a Bahamian nonprofit to establish a marine reserve zone and research facility in Long Island, Bahamas. Eric Eikenberg, Executive Director of the Everglades Foundation, noted Rumberger’s long involvement with environmental conservation and encouraged everyone in the room to call elected representatives on behalf of pro-Everglade environmental policy. “We need to ensure that in these tight budget times the commitment to conservation remains strong,” Eikenberg said. Debbie Rumberger, Rumberger’s widow, called the scholarship an apt send off for her late husband.